One of my favorite stories this time of year is from Charles Dickens… A Christmas Carol. This isn’t really going anywhere in terms of this week’s cooking segment of In The Kitchen With Scotty, but it did get me thinking about a classic Christmas Dinner. Roast turkey and ham are the most popular and familiar choices… basically, a repeat of one month ago and Thanksgiving. My preference is for a good old fashion “Sunday Roast” English style, the Standing Beef Rib Roast & Yorkshire Pudding. If this will be your first go at a standing rib roast, leave it to the professionals to trim your roast… namely your favorite butcher. You are going to want a bone in rib roast trimmed, “Frenched” and tied. Now, what does all that mean? Trimmed just means the roast is free of any overabundance of fat from the roast. 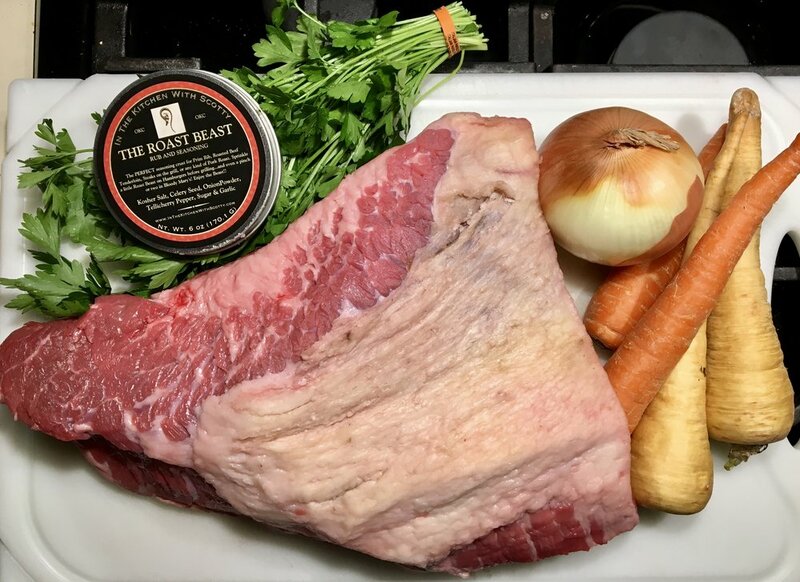 Yes, you will want of plenty of fat to keep the roast flavorful, but there is a big old fat cap on top of the rib roll that you will not want to consume, let alone pay for when it comes to "price per pound". Don’t worry, the butcher is going to get his money in the end for prepping this roast for you. 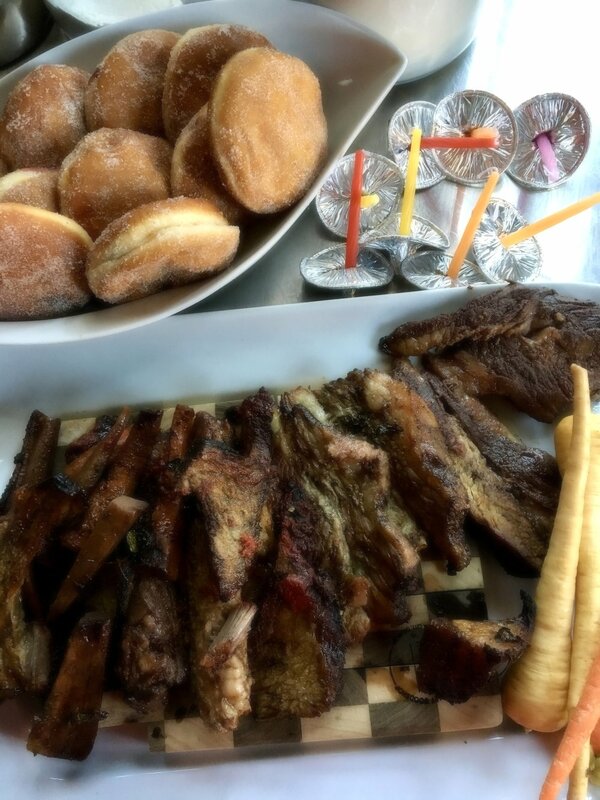 “Frenched” just means your want the rib bones free of any meat, scraped down, and exposed. It makes it “prettier” and more interesting visually. A definite classic appearance when roasting this cut of meat. Tied means the roast is trimmed, the bones are frenched and the roast has been properly prepared, you want it to be trussed or rolled and tied properly for roasting. Now the classic Yorkshire Pudding. No, it is not pudding, Puddin’! Pudding in the English vernacular refers to any baked item sweet or savory… click this Yorkshire pudding link to read all about it. Yorkshire pudding just adds that side dish appeal to the roast and is the best catch-all for the savory sauce and “bark” from the roast. It truly is a treat! A temperature probe/thermometer is your best friend when roast meats! Have your butcher “French Trim” and tie your roast. Catch this segment Tuesday morning and I will do a quick demonstration, otherwise Google it, if you wish to do this on your own. I say go for it! Preheat your oven to 550 degrees Fahrenheit. Coat the entire rib roast with my Roasted Beast seasoning….or, if you are temporarily out (wink wink) a nice blend of Beau Monde seasoning or salt and fresh cracked pepper will work. Not as good, but it will work. Chop the onions, carrots and celery and place on the bottom of a roasting pan. Add the fresh whole garlic cloves and fresh sprigs of thyme. Place the roast on top of the mirepoix, fat side up and place into the oven. Immediately turn down your heat to 350 degrees and roast 10-15 minutes per pound. The desired internal temp of the roast for medium rare should be 120 degrees. Thus a good and reliable MEAT THERMOMETER is your best friend when roasting this beautiful piece of meat. My roast cooked for 1 hour 25 minutes and I pulled it out when the thermometer read 120 degrees. The temperature will rise, known as “carry-over cooking” once out of the oven, with a final cooking temp of 125 degrees Fahrenheit. Remove the roast from the pan and set aside covered in foil to rest. Skim off as much of the rendered fat drippings as you can. 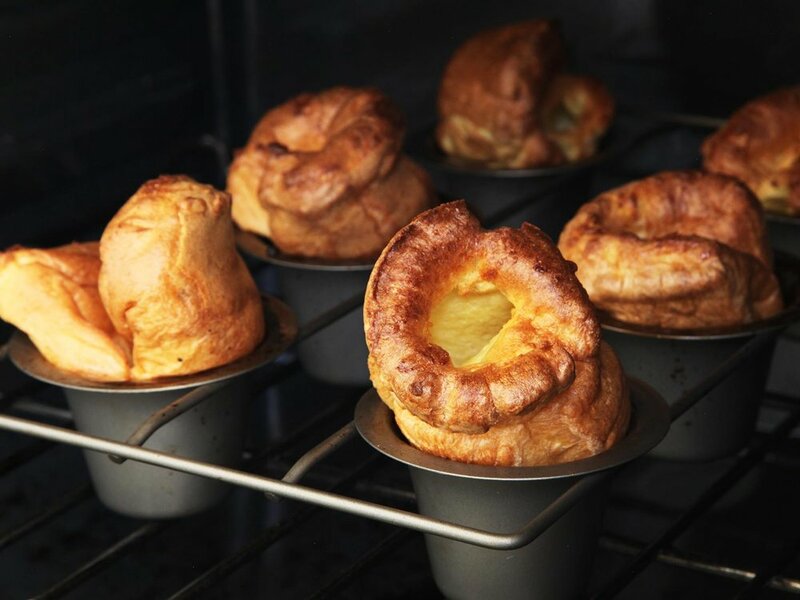 This “tallow” is a perfect use when making the classic Yorkshire Pudding. Over medium-high heat on your stovetop begin heating the roasting pan with the drippings and mirepoix still inside. Gently pour in the red wine and scrape up (deglaze) all the delicious cooked bits from the bottom of the pan. Bring to a simmer and then add the beef stock. Gently cook the wine and stock along with the roasted mirepoix until the sauce is reduced and thickened. Strain out into a sauce boat and keep warm until service. When ready to serve the roast keep in mind that each “rib” section of the roast will serve 2-3 people. You may slice off large portions for any heavy eaters, or slice thinly for smaller portions. I say go big... It is Christmas after all! Poring the batter into smoking hot pan and oil makes the perfect Yorkshire Pudding! In a blender add your milk and eggs and give it a good pulse or two to combine. Next, add your flour and salt, and blend until smooth and frothy. Pour into a container, preferably something pourable like a batter bowl or large liquid measuring cup. Cover and refrigerate at least 30 minutes to overnight. After your roast is out of the oven and is resting covered, pour off as much of the fat drippings that you can. Ig you haven’t got quite 2-3 tablespoons then supplement with a flavorless oil such as grapeseed or canola oil. If you prefer not to use the pan drippings, using straight oil will be just fine. Fresh out of the oven! Light, golden, and full of flavor. Preheat your oven to 425 degrees. 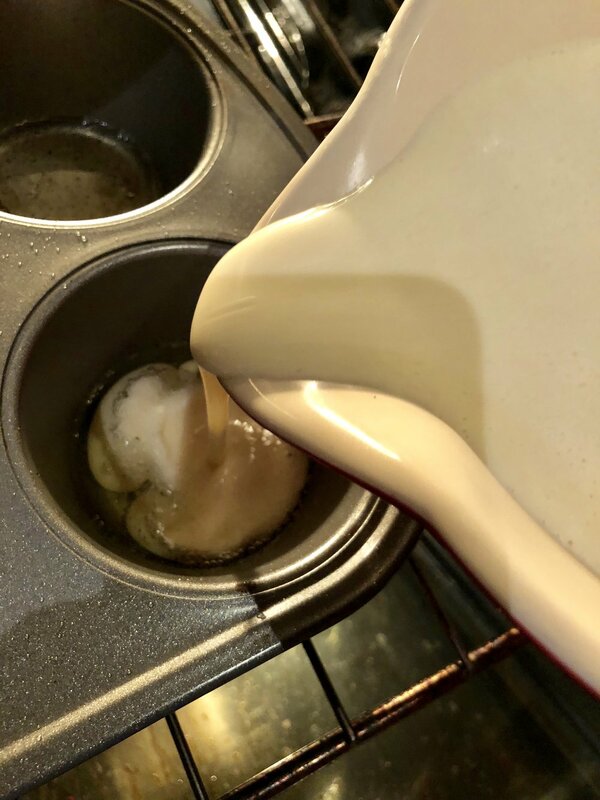 In a popover pan or medium sized cupcake pan, add 2-3 teaspoons of the rendered drippings/oil to each of the individual wells. Position the oven rack one level up from the center and place the pan into the oven. The pan and oil must be sizzling/smoking hot before you pour in the Yorkshire pudding batter. Let it heat up about five minutes. Gently slide the rack out using a hot-pad… don’t burn your fingers, and pour in the batter 3/4 full. You know the oil and pan are ready when the batter sizzles while pouring it in. Gently slide the rack and pan back into the oven and bake for 20-25 minutes. Pull them out when golden brown and serve right away alongside your roast. They are the best vehicle for soaking up the delicious wine sauce reduction and crust bits from the outside of the roast. Wishing you and yours a very Happy Christmas…. And a Merry time eating! Cheers! Now that Thanksgiving is over and we have finished off the last of the pumpkin, sweet potato, and pecan pies, it’s time to start baking for Christmas. Anytime I think about Christmas my mind automatically turns to the kitchen… I love holiday baking! After a long week of preparing and filling In The Kitchen With Scotty orders, and cooking for my clients, there is nothing more relaxing for me, on a Sunday, than being in my OWN kitchen, with music playing and working out some dough or batter for the holidays. One of my favorite holiday bakes? The Christmas Stollen! Stollen’s German history goes back to the 15th century when it was originally called a Strietzel. First baked for the Saxon royal court for religious fasting it was never meant for celebrating. Basically consisting of water, yeast, flour, and oil because in those days butter and milk were off limits from Advent to Christmas, the Strietzel was just basically something bland and dry to fill your stomach… No way that would work now! In 1491 Pope Innocent VIII said…okay, you guys can have butter and milk during Advent “with the blessing of God”. 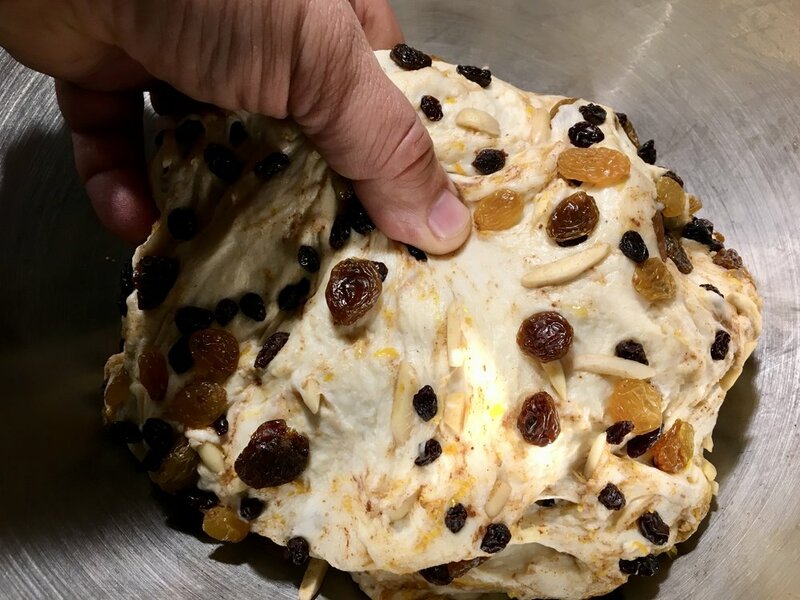 With the addition of butter and milk then came the addition of sugar, dried fruits, and almonds (like we do) … so then the Strietzel morphed into what we know now as an early form of Stollen. Stollen became such a big part of the German Advent to Christmas season that it started to be sent to German family members living far away from home. Most noticeably during World War One. Do you guys remember hearing the story about the English and German’s who stopped fighting during WW1 on Christmas Day? The story goes that on Christmas Day the English noticed that the Germans across from them had stopped shooting and began setting up make-shift Christmas trees and even heard them singing Christmas carols. Both sides stopped fighting and some crossed the “no man’s land” to greet each other on Christmas morning. The German’s shared their Christmas stollen sent by family members with some of the English. That’s one way the German holiday bake was introduced to other peoples and also became a holiday tradition for the English. 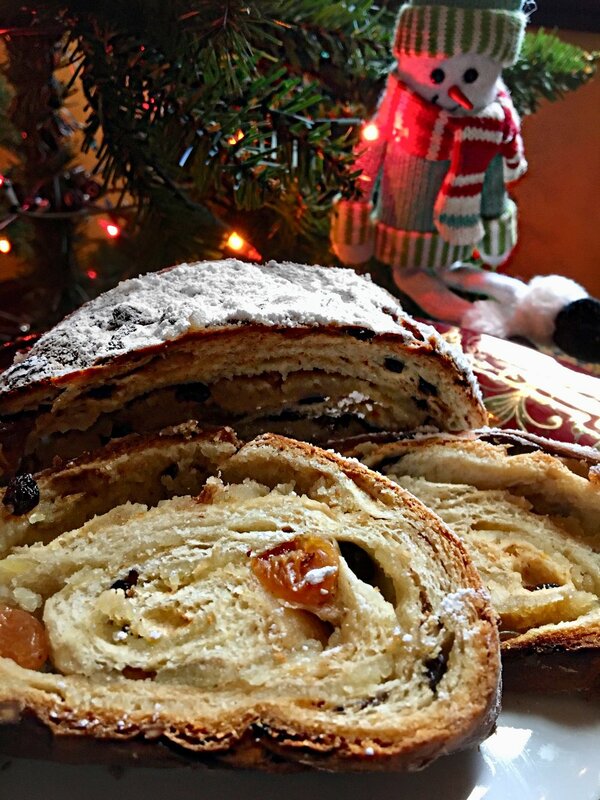 As with all cultures and traditions, along with the American story, the migration from one country to the United States brought those family traditions and the Stollen is now well represented in many American homes during the holidays. Dont forget the More Than Pumpkin Pie Spice! The dough is made, time to press it into the fruit and almonds. Now, let the dough rest and rise overnight in the fridge, or covered for tow hours in a warm space. Roll the dough out thin, lay the rolled out marzipan on top, and roll the whole thing up like a jelly roll. Brush with a little melted butter and your Stollen is ready for the oven! In a stand mixer bowl (or you can build your biceps and hand mix/knead) add the bread flour, sugar, yeast on one side of the bowl and salt on the other side of the bowl. Add the softened butter. Attach the stand mixer’s dough hook and begin running slowly. Pour in the milk and let the ingredients mix. Increase the speed and let the stand mixer with the dough hook knead and work the dough for approximately 5 minutes or until the dough has worked itself into a smooth ball. If the dough is too sticky and wet add a little flour and let it work into the dough. Turn off the mixer and pull out the dough hook. Let the dough rest while you prepare the dried fruit and almonds. 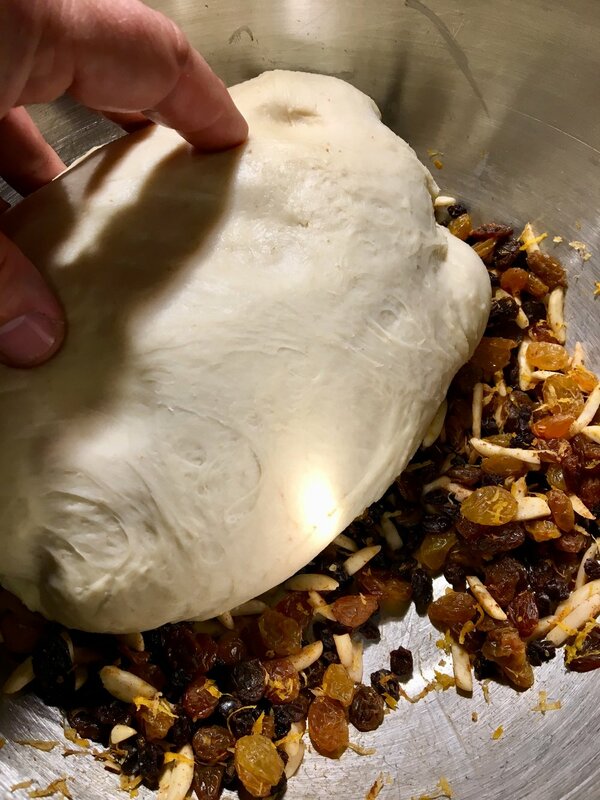 While the dough is resting… in a separate bowl combine the raisins, currants, lemon and orange zest, vanilla, almond extract, More Than Pumpkin Spice, and the slivered almonds. Toss with a spoon to combine. Pull the dough from the mixing bowl and place into the dried fruit and almond bowl. Begin kneading the dough in the fruit and almond bowl my pushing and folding all the goods into the dough. Once combined, form into a ball, cover the bowl wiretap plastic wrap and place in the fridge overnight. This will allow the dough to “ferment” and to rise slowly. Or you may proof for 2 hours in a warm spot. When ready to roll out your dough, dust a clean surface with a little flour. Push the dough out with your fingertips into a rectangular shape and then roll thin.. about the thickness of the raisins. On a separate rolling surface that has been lightly dusted, roll out the marzipan into a rectangular shape a bit smaller than the rolled out dough. This will be rolled up inside the dough. Brush the dough with melted butter for flavor and to let the marzipan adhere to the dough. Lay the rolled out marzipan on top. Starting with the longest end begin to roll up the dough and marzipan as you would making cinnamon rolls or a Swiss roll. Roll fairly tightly and lay seam side down. Cover your stollen loosely with plastic wrap or in a proofing bag and allow the stollen to rise another hour. When ready to bake, preheat your oven to 350 degrees. Brush the top and sides of the stollen with melted butter and place on the middle shelf of your oven. Bake for 50-55 minuses depending on your oven or until the stollen is golden brown and fragrant. Remove from the oven a cool completely. Stollen is one of those baked items that is best when cooled completely. The Marzipan inside will be runny and gooey and will need to be cooled before slicing. Dust your stollen with powdered sugar generously. Slice into pieces and serve with Mulled Wine, hot cider, or hot tea. Enjoy!